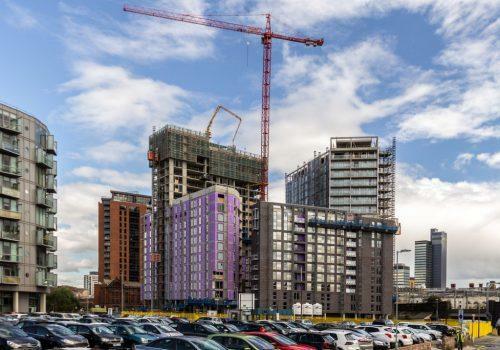 Premier Technical Services Group PLC (PTSG) is to install lightning protection and earthing systems at another of Manchester’s new developments: The Residence. The Residence occupies a prominent position within Manchester’s stunning new £400 million Greengate Masterplan Project, overlooking the River Irwell. Upon completion, the £70m development will include one of the tallest residential buildings in the city with 33 storeys, and another of 14. As the UK’s leader in the design, supply, installation and maintenance of lightning protection and earthing systems, PTSG Electrical Services Ltd.’s reputation extends nationwide. Group-wide, PTSG has 31 office locations, 13 of which are dedicated to electrical services, also providing fixed wire and portable appliance testing for a wide range of clients. © Copyright Peter McDermott and licensed for reuse under this Creative Commons Licence.